Writing reviews can put some serious cash in the bank if you make it work for you, 24 hours a day 7 days a week. I want to teach you to focus on ClickBank’s marketplace as your source for content and cash when writing reviews for your blog. There are many excellent reasons to do this – both for your readers’ sakes and for your own affiliate marketing success. 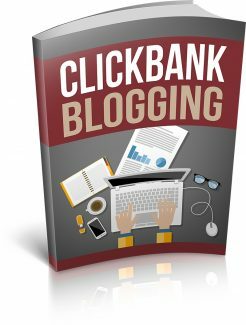 For one thing, ClickBank product quality can vary widely. People need a “guide” to get them safely past the duds to find targeted products they really need. Anyone who can deliver rapidly becomes an “authority” – which is the fast track to turning yourself into a sought-after super affiliate. In order to do this, however, you need to know how to get past those duds yourself. I cover more than just blog posts as a review delivery method in the report you are reading now. You can use other media too, to bolster your efforts, and that’s just one of the topics I cover, too. It also includes my 9 secret strategy tips – such as creating backlinks within your own site, to your own archived content, to dramatically increase your review site SEO! Reviews are said to be the most important component of affiliate marketing. There are some subtle and not-so-subtle reasons for that. 1. People like to feel you’re in their “corner”. When an affiliate marketer takes the time to nurture the members of her niche, solve their problems and look out for their interests, each member comes to trust the person who does good things for them – and consistently helps them succeed. How do you do all these good things? By finding them exactly the product they need to solve this week’s problem or enhance their lives (or even just their hobby). You do this by focusing on their problem, not on the product. Strange as this may sound. After you’ve showed them the pros and cons of a product, directing them to your affiliate link should feel as if it’s almost an afterthought, or – even better – as helpfully supplying the exact way to do what you’ve just been talking about. 2. People don’t like being “sold” to. Nobody likes to be manipulated, and that’s what the old-school style of aggressive selling amounts to, in most people’s minds today. When you’ve shared a secret method of making money with your reader, it should feel as if you’ve truly shared a secret method, and helped them in the process. In fact, affiliate review blogging embodies this softer sell, service-based method of selling – as well as helping you comfortably maintain your integrity and ethics. Years ago, I had an opportunity to watch a friend at work in a “tack” (equestrian supplies) store. This happened on a busy Saturday, and it was a revelation to see how patiently and helpfully she matched customers and their horses with the right saddles and bridles. By patient questioning and listening, she focused on the areas of horsemanship each customer indulged in, taking into account their budget, and what would give them the best performance and comfort for their needs. She repeated the same focused, patient procedure for Western boots, specialty horse feed, hoof products, supplements, riding apparel, hoof picks and English safety-approved helmets, too. No product was too “small potatoes”, if it would help her customer and his horse enjoy a better equine experience.